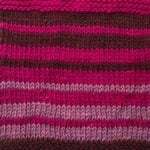 I love the sinuous path that yarn overs and slanted decreases create. 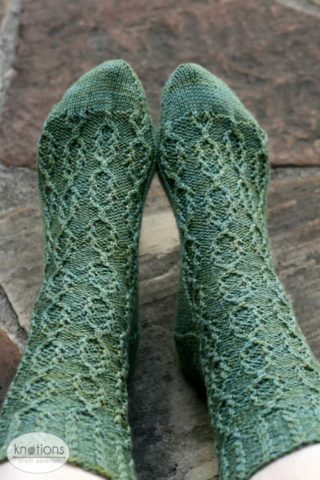 Add in a few traveling stitches and a cable twist or two and you have some decidedly leafy socks. 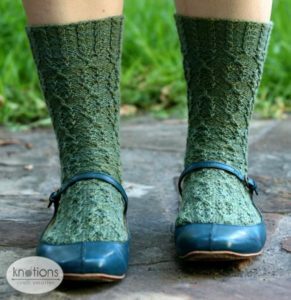 These socks are knit top-down, and the twists between leaves are echoed in the cabled cuff. The pattern transitions into an eye of partridge heel and the socks are finished with a simple wedge toe. Knit them in a fiery colorway for fall or a forest green as you dream of the eventual spring! Small [Medium, Large]. Shown in size Large. Actual size: 7.1″ [7.5″, 8″] circumference. 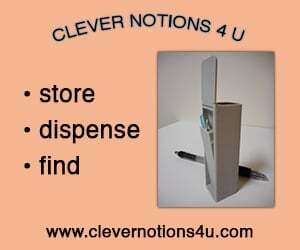 To fit: 7.75″ [8.25″, 8.75″] foot circumference. Hand Jive Nature’s Palette (100% wool; 185 yards [169 meters] / 50g skein): Color Mallard, 2 skeins all sizes. 9 [8.5, 8] sts = 1″ in St st. 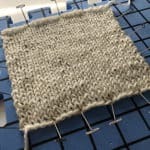 I suggest using a thinner sock yarn (for example, Lorna’s Laces Shepherd Sock) for the Small size, as 9 stitches per inch is a very dense gauge for the Nature’s Palette yarn. Two stitch markers; one stitch marker of a different color to mark the beginning of round; tapestry needle; cable needle. CO 64 stitches. Join in the round, being careful not to twist. Place the beginning of round stitch marker at the join. Set up rnd: P1, *k2, p2, rep from * until three stitches remain, k2, p1. Repeat Set up rnd once (2 rnds worked). Work Rnds 1-4 of the Cuff Chart, repeating chart eight times in each row. Repeat Cuff Chart three more times. Work Rnds 1-16 of the Oak Leaf Chart, repeating chart four times in each row. Repeat Oak Leaf Chart two more times. Work Rnds 1-9 of Oak Leaf Chart, repeating chart four times in each row. [Work Rnd 10 of Heel Chart] twice, [work Rnd 10 of Oak Leaf Chart] twice. Repeat as above for Rnds 11-16 of of the Heel and Oak Leaf charts. Remove the beginning of round stitch marker. You will work the heel flap back and forth over the first 32 stitches of the round. Repeat Rows 1-4 an additional 7 times (32 rows total). Knit across 10 heel sts. Place the beginning of round st marker. K across the 10 remaining heel sts. Pick up and knit 16 sts along heel flap, one for each slipped st. PM. Pick up and twist the bar between the gusset and instep sts and place it on the left needle, p2tog. Work the Oak Leaf Chart, sts 2 through 16. Work the Oak Leaf Chart, sts 1 through 15. Slip the next (purl) st to the right needle. Pick up and twist the bar between the gusset and instep sts and place on the left needle. Slip the purl st from right to left needle, ssp. PM. Pick up and knit 16 sts along the heel flap. You now have 20 heel sts, 16 sts in each gusset, and 32 instep sts; 84 stitches total. Rnd 1: K to marker, SM. Work instep sts using the Oak Leaf Chart, SM. Knit to beginning of round. Rnd 2: K to two sts before marker. K2tog, SM, work instep sts using the Oak Leaf Chart, SM, ssk. Knit to beginning of rnd. Repeat these two rnds until you have 64 sts on the needles. Knit to marker, SM, work instep stitches using the Oak Leaf Chart, SM, knit to beginning of round. Repeat until sock is 2″ [5 cm] shorter than the desired foot length. Repeat until 28 sts remain, then work Round 1 twice. Cut yarn and graft the top 10 sts to the bottom 10 using Kitchener stitch. 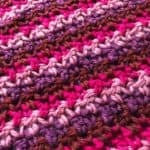 Weave in ends, block, and enjoy! Kelly is a computer scientist by day, knitter by night. She is dreaming of cooler days so that she can finally wear all of her handknit socks! You can read about her knitting, spinning, and sewing adventures at kelp! knits. Pattern and images © 2008 Kelly Porpiglia.